On the night of 11 June, two 2 pdr guns of E Troop, 228 Anti-Tank Battery, were moved up to Ningthoukhong and manhandled with great difficulty into the forward area. They were just in time, for soon after 0500 hrs on the next day the Japanese attacked again, supported by a heavy artillery and mortar bombardment and by tanks firing at close range. The first wave, consisting of about two companies supported by five tanks, overran the inner platoons of the 2/5 Royal Gurkhas and forced them back some two hundred yards. One of the 2 pdrs commanded by Sergeant Ward received a direct hit in the opening bombardment, wounding two of the crew and putting the gun out of action. The remaining 2 pdr commanded by Sergeant J. Espey went into emergency action firing off its wheels at the leading tank barely 50 yards away. The gun layer, Bombardier C.J. Dorrell, could not see the tank, so Sergeant Espey lay on top of the 'bund' (embankment) to observe the shoot. Firing from behind the bund, they were unable to depress below the turret of the tank, but registered three hits and knocked the main 47mm gun off. The team then moved the 2 pdr to a better position and engaged and destroyed another tank setting it on fire. The enemy crew abandoned the tank and tried to extinguish the fire, but were scattered by the fire of the detachment's Bren gun. The 2 pdr was once again manhandled back to a new position under fire, where it remained in action on its platform. The next two tanks bogged themselves down in the mud whilst trying to avoid this danger and the third got stuck in a lane. Bombardier Dorrell later recalled that they had stood-to all night and were in the process of pulling the gun back to camouflage it for the day when the Japanese attacked. After first taking cover from the incoming mortar and small arms fire, a medium tank then came down the track towards them, which they tried to engage, but couldn't get enough depression with the gun being in the emergency position on its wheels. The tank later reversed about 40 yards up the track and stopped, but with a slight bend in the track they again couldn't sight the gun onto the tank. With Sergeant Espey observing from the bund, Bombardier Dorrell fired three rounds; the first going over the top, the second hitting the top of the tank and the third putting the tank out of action. One member of the gun team was wounded in the action. Later, when engaging two light tanks further to the left, the gun was moved into position on the roof of a dugout prepared by the Gurkhas. Sergeant Espey jumped underneath the gun and held the legs while Bombardier Dorrell fired and knocked out one of the tanks. The situation at Ningthoukhong was stabilised by 0930 hrs with the support of artillery fire and air support. 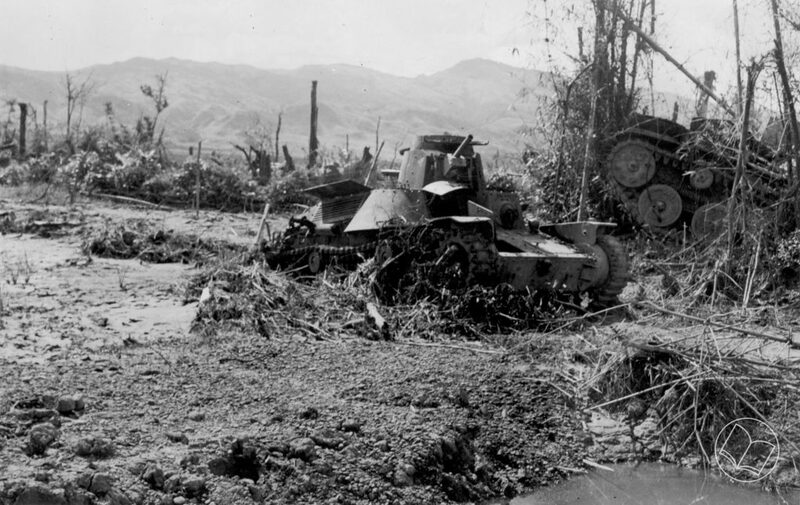 A counter attack was launched in the afternoon by two companies of the 1/7 Gurkhas, but was held up by the bogged tanks still firing their guns. Two of the tanks were finally destroyed by a Gurkha Rifleman, Ganju Lama, who won the Victoria Cross for this courageous action. By 1600 hrs the last of the Japanese were evicted and the situation was completely restored. The damaged 2 pdr was recovered in the counter attack and Sergeant M. O'Riordan's gun from Potsangbam moved up to replace it after dark. Sergeant Espey was awarded a well merited Military Medal for his inspiring leadership and bravery, as would Bombardier (later Sergeant) Dorrell the following year for his exceptional courage. The history of the 2/5 Royal Gurkhas records that Sergeant Espey's gun had been a tower of strength.